Karen enjoys both telling in modern times and bringing the past to life with living history presentations. Her effervescent style engages emotions, from the sublime to the ridiculous, in audiences both young and old. She has presented in a wide range of places: libraries, bookstores, schools, senior centers, churches, Pig War re-enactments, Medieval wedding receptions, and ghostly bonfires. Her stories, both traditional and new, may bring laughter, tears, shivers, or a deep thought or two, but will always entertain. A former Teacher and Museum Curator of Education, Karen is one of the founders and organizers of the annual Tacoma Living History Cemetery Tour. She can often be found bringing the past to life at Northwest historic sites such as Job Carr Cabin Museum, Champoeg State Heritage Area, Fort Nisqually, and San Juan Islands National Historic Park. Her living history presentations have been featured at National Historic Oregon Trail Interpretive Center, End of the Oregon Trail Interpretive Center, Fort Clatsop, and the Whitman Mission National Historic Site. She feels especially rewarded telling the tales of those whose voices are usually silent in history -- women. 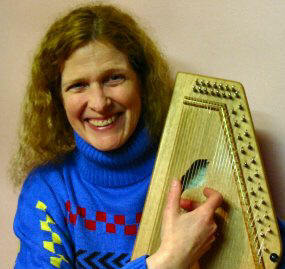 Drawing on her experiences as a K-12 music educator, she incorporates music and sing-alongs into many of her presentations, often bringing along folk instruments such as autoharp, mountain dulcimer, wire-strung lap harp, or penny whistle. She enjoys presenting to classrooms and assemblies and will provide related learning standards upon request. As well as weaving words, Karen spins and weaves fibers as she brings traditional crafts to reenactments and presentations. Desiring to help revitalize the art of storytelling and promote living history, Karen leads workshops for beginning storytellers and history interpreters of all levels. She firmly believes that our stories tell who we are, where we've come from, and where we're going.